You may have heard that fractures typically take 6-8 weeks to heal. What affects how long and if they take longer? Read on and you may be surprised. When you find out that you've broken a bone, you can't wait for it to heal so you can get on with your life. There are a lot of things going on in your body to try and heal this injury and some things that you do can make it take longer. Reasons that fractures don't heal (or heal slowly) can be very obvious and others are not. What are the most obvious or well-known reasons that complicate healing of fractures? 1. Smoking: We all know taht smoking isn't good for you. We have heard that many lung conditions can result, including cancer. Another way that smoking affects the body is that it contracts (or closes off) small vessels and chronic use can cause calcifications that can block blood flow. When a bone is broken, it needs the nutrients and oxygen present in blood to heal. When smoking, the blood vessels cannot get the blood to the bone. This can delay healing of a fracture and in many cases the bone will never heal. Another reason to kick that habit! 2. A BAD fracture: When your doctor looks at the x-rays of your fracture, it can look very different from one injury to the next. The position of the bone pieces is important to note. The farther these pieces are from being in normal alignment, the longer they will take to heal – and in some cases they may not be able to heal. 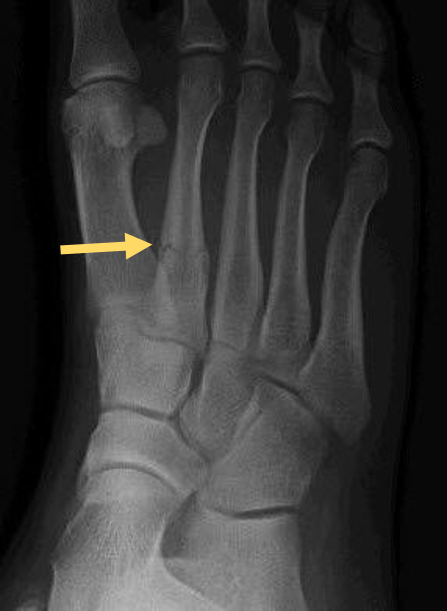 In addition, the location of the bone fracture is important. Some bones in the foot are surrounded by other bones and tissue that can protect the area as it heals. Other bones serve as attachment points for muscles/tendons and the activation of these tendons/muscles can move the fracture just enough day in and day out that it doesn’t allow the body to bridge that gap completely. 3. Not listening to your doctor! Fractures require TLC to heal. Bone cannot form well in an area if there is excessive motion. That means that if your doctor recommends a splint, cast, boot or taping – these are all efforts to minimize motion at the fracture site and allow your body to lay down new bone. Moving too much, getting back to work or exercise too soon sets your fracture up for failure. The better you are able to rest at the beginning, the more smoothly the healing process will go. 1. Anti-inflammatories? There is some evidence that anti-inflammatories such as Motrin, Aleve and Celebrex can inhibit bone healing in it's early phases. Of the small studies that have looked into this, some were unable to eliminate other risk factors of healing (smoking and otherwise), so to some extent the jury is still out! That being said, the better you rest, the less likely you will be to reach for that bottle of pills as this minimizes inflammation and therefore pain. 2. Salty foods – what you eat can help or harm you in terms of bone healing. Excessive calcium excretion by the kidneys means that there is less left to bulk up your bones. Limiting salty foods helps ensure that your whole body system is functioning its best! 3. Winter and not enough time in the outdoors – You can have all the calcium in the world, but if you don’t have vitamin D, it’s all for nothing! Calcium is good for bones, but in your body it cannot be absorbed into bones without the help of vitamin D. Vitamin D is synthesized in your body, as a reaction to exposure to sunlight! Especially in the Midwest during long winter months, many people are deficient in vitamin D. While supplements are available, they are no substitution for sunshine! The supplements may be necessary in the winter if the sun isn’t there…unless you can get a prescription for a sunny vacation??? 4. Cola – coke, soda, soda pop, pop...While the term may vary by region, dark cola drinks contain phosphoric acid, which is shown to weaken the intestines. When we eat food and digest it, the nutrients have to be absorbed in our gut (intestines). When your intestines encounter high amounts of phosphoric acid, this decreases calcium absorption – weakening bones and therefore prolonging healing. 5. Caffeine – Just like anything else, caffeine in moderation is OK. Excessive caffeine leaches calcium from bones, making them weak. 6. Alcohol – As with caffeine, when someone drinks heavily, there is a correlation with low bone mass, which leads to decreased bone formation - which increases risk of fractures and delayed healing. Alcohol intake is recommended to be no greater than 1 drink per day for women and 2 per day for men. 7. Medications – chemotherapy drugs kill fast growing cells by design. When a fracture has occurred, the bone cells can also be greatly damaged affecting healing. Oral steroids such as prednisone and cortisone also slow healing, as they are such strong anti-inflammatories that some of the ‘good’ inflammation that happens during bone healing can be affected. So if you suffer a fracture or just want to avoid one, aim for a balanced diet, daily activity and getting some sun! Avoid bad habits like smoking, and excessive use of alcohol and caffeine and listen to your doctor!